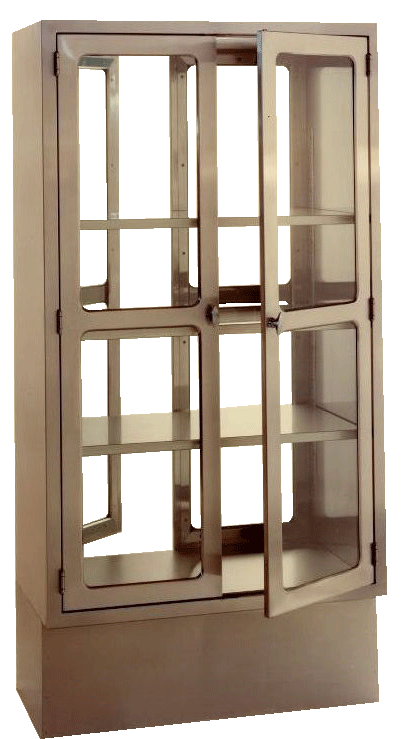 Continental Metal Products Lead Lined Pass Through Operating Room Cabinets are specialized and lead lined for x-ray protection in clinical applications. CMP Stainless Steel OR Pass Thru storage cabinets combine effective radiation protection and durability. Lead Lined Supply Cabinets and consoles, are perfect for Hybrid ORs, IR and Cath Labs to save space while offering lead shielding protection. . Lead Lined Hospital Pass Through Operating Consoles have become increasingly popular for today’s technologically advanced OR. CMP Pass Through Operating Room Cabinets can be configured for your unique requirements. Designed to be install in wall or OR, “Pass Through” Storage Console shall be constructed of Type 304 stainless steel with No. 4 finish. Welding is to be done by Heliarc process, exposed welds to be ground and polished to match No. 4 finish. Dimensions of unit as listed in the Specifications section. Console shall contain one fixed bottom shelf and three adjustable intermediate shelves. Both front and back of the unit shall be enclosed with two full-height, hinged, glazed doors with chrome-plated knob handles and stainless steel frame. Each door shall have 1/4″ (6mm) thick shatter-proof, safety-glass panes. Two sets of doors shall enable loading of cabinet from one side and unloading from other, thus permitting storing of surgical instruments without entering OR. CMP’s Interlock mechanism prevents either door from moving when the opposing door is open, protecting your OR environment during material transfer. In this way, insuring that the interlocked door cannot be forced open.